During the development of my first Windows Phone 7 application that will appear soon on the MarketPlace, I ran into a small issue with Visual Studio 2010. For the game I am developing I am making use of a number of UserControl’s. They contain a lot of intelligence about how to be drawn, what action to be taken and a few more things. 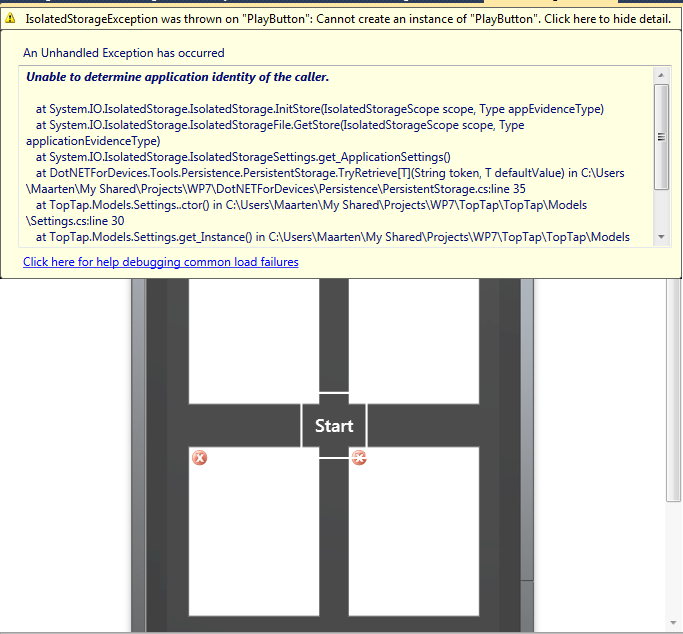 I am also making use of a number of application settings, wrapped inside a class and stored in IsolatedStorage. These settings can be modified using a Settings Screen, and after modification, the settings will immediately be stored to IsolatedStorage without user intervention. So far so good. Until I decided to make use of a number of these settings inside my UserControl. All of a sudden I got exceptions in the designer. Interestingly enough, the exceptions occur due to IsolatedStorage issues when running constructor code of my UserControl’s. Looking at the code inside the constructor it was obvious that I wanted to access a few properties from my Settings class. Of course this class is not initialized in designer mode, meaning it tried to read the values from IsolatedStorage on my development machine. This caused the exceptions. At first I thought that this was a bad thing happening to me. However, it turns out that it is not bad at all that this particular error occurred. It started me thinking. It also made me realize that my ‘generic’ UserControl should not directly make use of application specific settings. After all, this would make my UserControl less generic. Instead, what I should have done is passing important settings to my UserControl from within my application. After all, the application knows when settings are available and where they are coming from, knowledge that the UserControl should not know anything about. A ‘perfect’ example of a situation where design time errors inside Visual Studio 2010 helped me to make my application better.